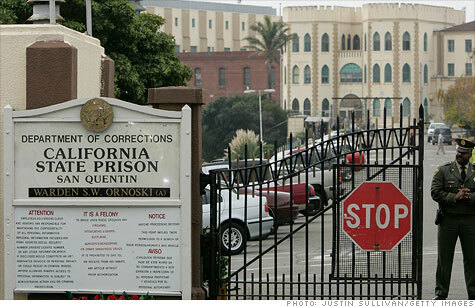 NEW YORK (CNNMoney) -- California's San Quentin prison, famous for hosting both Johnny Cash concerts and the state's most dangerous inmates, won't be getting a new death row facility as planned. Gov. Jerry Brown announced Thursday that he is canceling the long-planned construction of a new housing facility for condemned inmates. The cancellation is Brown's latest push to close his state's staggering deficit. He has already frozen state hiring, cut official cell phone use and prohibited agencies from passing out freebie trinkets like hats and cups. "At a time when children, the disabled and seniors face painful cuts to essential programs, the State of California cannot justify a massive expenditure of public dollars for the worst criminals in our state," Brown said in a statement. San Quentin is the home of California's only gas chamber, and the state's death row for male inmates is located at the prison. The new construction would have added another $356 million to the state's debt, Brown's office said. "It would be unconscionable to earmark $356 million for a new and improved death row while making severe cuts to education and programs that serve the most vulnerable among us," Brown said. In addition to the headline cost, the state would have been on the hook for $28.5 million in annual debt service that would have come out of California's general fund. The prison's current death row holds 675 prisoners, but was only designed to accommodate 554, according to the California Department of Corrections and Rehabilitation website. Paul Verke, a spokesman for the department, said that $20 million has already been spent on planning the new 1,152 bed, 541,000 square foot facility. With no new construction, the state will continue to use the prison's current death row, he said.